THREE people including a young girl have had a lucky escape after their vehicle overturned in floodwaters. It comes as new warnings have been issued and Townsville starts a mammoth clean-up. Emergency services received reports that a vehicle had tried to cross a flooded creek on Mackay Eungella Road, west of Mackay, just before 10pm last night. A woman and man aged in their 40s and a primary school-aged girl were in the vehicle, which then overturned in the water. All three occupants were able to free themselves from the vehicle, with the man and child making it to safety. The woman was swept away down the creek but was able to grab onto a tree and make her way out. The three were assessed by paramedics. It comes as a new emergency alert was issued this morning. Hundreds of people remain holed up in evacuation centres waiting for the floodwaters to recede in Townsville, while some others have been able to return to their homes. About 10,000 Townsville properties remained without power this morning. A new emergency alert was issued overnight for the inland region of Hughenden, about 485km southwest of Townsville. Queensland Fire and Emergency Services warned residents that the Flinders River was expected to cause flooding on the north side of the river. The message, issued about 1.30am, advised locals to warn neighbours, secure their belongings and move to higher ground if required. 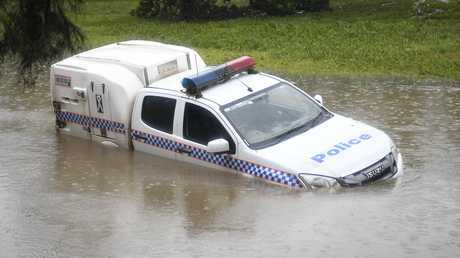 Meanwhile the people of Ingham and its surroundings are on high alert with major flood levels expected this morning. A warning has been issued for the Herbert River after 85-130mm of rain was recorded in the Herbert catchment in the 12 hours to 5am today. The Herbert River at Abergowrie Bridge is steady at 8.91m - the minor flood level being 6m. It is likely to remain above 6m this morning. The Herbert River at Ingham Pump Station is currently at 9.77m and rising, with levels to exceed the minor flood level of 10m this morning. 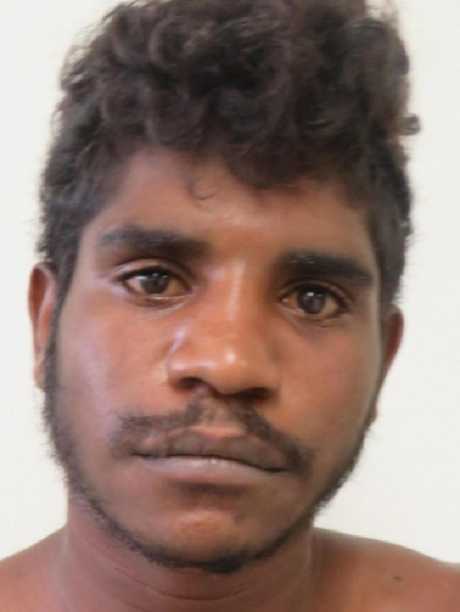 Meanwhile an investigation is under way into the conduct of police after Townsville's big wet turned deadly when the bodies of Troy Mathieson, 23, and Hughie Morton, 21, were discovered in a drain. Ethical Standards Command flew into Townsville from Brisbane to commence an investigation. 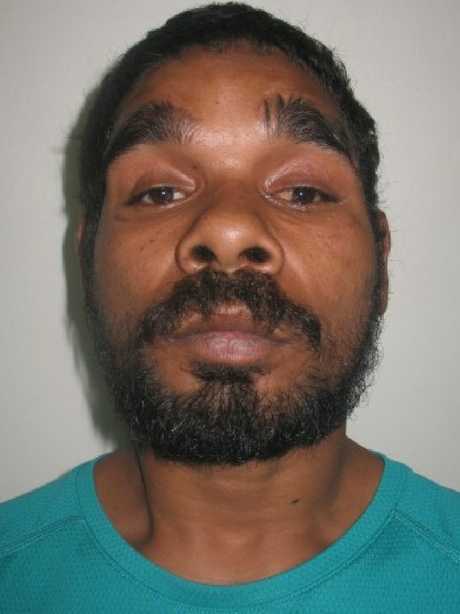 It is understood police were chasing the men from the scene of an alleged break-and-enter at Aitkenvale Monday morning. Kandace Wyles, a cousin of the men, said she was devastated. "They (the family) are not coping at all," she said. The two were last seen by police in the early hours of Monday morning when the flood crisis was at its worst. 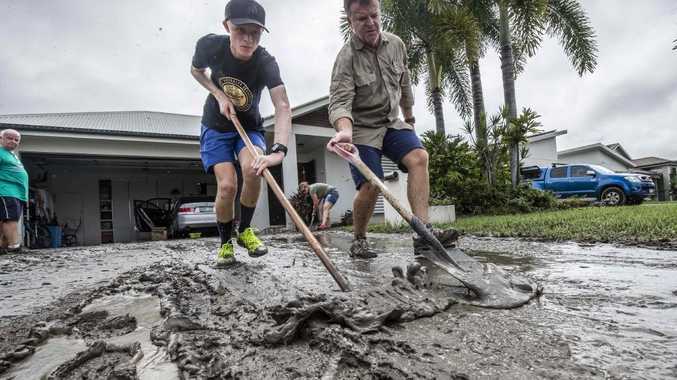 The floods have seen Townsville endure its worst flood on record. The federal government today announced it has relaxed the rules on who can access disaster funding following Prime Minister Scott Morrison's tour of flood-struck Townsville. Previously, residents could only apply for federal government relief if they suffered damage to at least 25 per cent of their homes but that rule has been abolished, and they can now apply if water has gone over floorboards in their house. "After seeing first-hand the challenges faced in Townsville yesterday, I asked for changes to be made last night to the eligibility for the disaster relief payment," Mr Morrison tweeted today, less than 24 hours after visiting the city. Lachlan Gleeson, 27, and Erin Hanna, 25, were at a house over the weekend when floodwaters began rushing into the cul-de-sac outside. The sheer volume of water began flooding houses across the street and started to build up along a fence at the end of the cul-de-sac. Mr Gleeson and Ms Hanna joined with neighbours to break down the fence to allow water to flow out on to the street before getting out themselves. "We took what we could and got out of there," Ms Hanna said. "The water just came racing in." 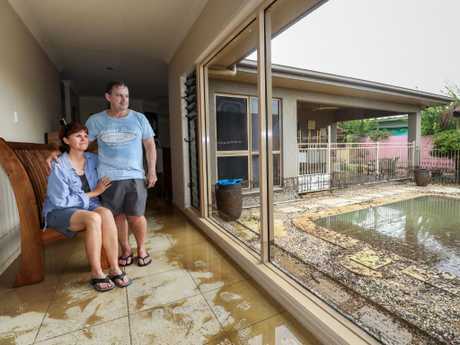 Townsville-born-and-bred resident Greg Copnell was one of many who remained inside his home as water inundated those around him. 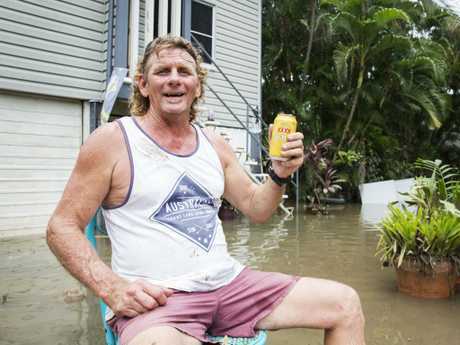 The Hermit Park resident refused to leave as floodwaters rose to the floorboards of his high-set Queenslander. "I only began to worry at about 1am (Sunday) when it reached its peak," he said. "The water was almost up to the floorboards upstairs. I was never going to leave. I was going to go down with the ship." Mr Copnell and his partner remained safe and dry ­upstairs, but under the house was inundated with water and mud. "All you can do is laugh," he said. "We'll just have to wait until the water recedes now and then start cleaning up." Despite a brief respite yesterday, more rain is forecast to hit the region today and tomorrow. A further 160mm of rain could fall on Townsville before the weekend, following heavy falls around Proserpine and Mackay. The Townsville area has had more than a year's worth of rain in just 10 days. The Bureau of Meteorology's Vinord Anand said Upper Bluewater (2140mm) and Paluma (2212mm) had smashed the average annual rainfall of 1127.9mm. Ross River Dam had last night fallen to 193 per cent, but the water spilling from its gates was still "violent" yesterday afternoon. Chopper pilot Lieutenant Colonel Jamie Martin, said the water had subsided quickly. "The worst depth of water was on the bottom of Idalia," he said. "(In Rosslea) all you could see were the trees and half of the houses poking up at 9am on Monday morning. I'd say it's come down 1.5 to 2m since then. 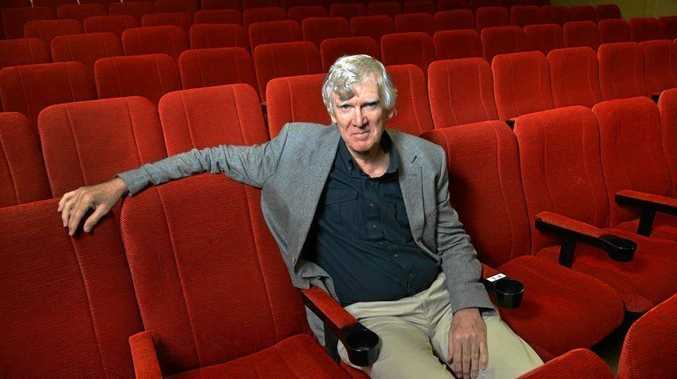 "The most significant thing was the extent of the inundation. For us, it was that we were able to get in there and get people out, it was pretty congested with debris." Prime Minister Scott Morrison visited ground zero yesterday, reassuring the city it would receive all the necessary funding to help clean up.